The Tax Cuts and Jobs Act (TCJA) of 2017 made significant changes to the U.S. tax code. But one year later, many taxpayers are in need of clarification. Perhaps the greatest uncertainty regards qualified improvement property (QIP). A large drafting error omitted QIP as eligible real property which is normally eligible for bonus depreciation. The drafting error specifically affects QIP, which is nonstructural real property that is installed on an interior portion of a nonresidential building, after the building was originally placed in service. Examples include new lighting systems, drywall partitions and room renovations that a restaurant or retail store might install. QIP excludes expenses for any improvement attributable to the enlargement of the building, any elevator or escalator or the internal structural framework of the building. When the TCJA was enacted, QIP was intended to have a 15-year depreciable life, which would qualify that property for 100% bonus depreciation and allow for an immediate tax deduction. Unfortunately, an error was made when the new law was drafted, and the portion providing a 15-year life for QIP was eliminated. Because of this error, QIP was assigned a depreciable life of 39 years under the final law—a vast difference from being able to take an immediate deduction. One year after the TCJA was enacted, Congress has not acted to make a technical correction. That leaves taxpayers in flux about how to move forward with their 2018 returns. On Jan. 2, outgoing House Ways and Means Committee Chairman Kevin Brady (R-TX) released draft legislation of technical corrections for the TCJA. However, with the changeover from Republicans to Democrats in control of the U.S. House of Representatives, it appears that action has come to a halt. The newly formed House intends to hold hearings on unresolved provisions of the TCJA before moving forward. These hearings are not expected to take place until March, at the earliest. To add insult to injury, it is not clear if changes to QIP would be retroactive. 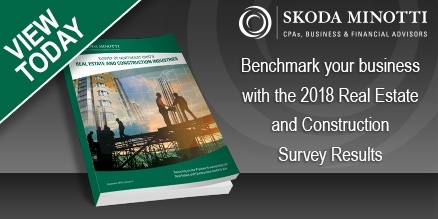 For taxpayers who recently performed major renovations on a building or purchased or constructed a building, a cost segregation study can help identify ways to decrease their tax burden—especially if Congress delays taking action to correct the QIP error. Cost segregation breaks out portions of a building that are treated as personal property for tax purposes. Such property recognized could be eligible for bonus depreciation. It will be important to complete a cost segregation study before you file your tax return. Skoda Minotti will be monitoring congressional action on this matter, and will provide updates to you in a timely manner. For more information about this issue or other Real Estate Industry matters, please contact Dennis Murphy, CPA, at 440-449-6800 or email Dennis. This entry was posted in CPA & Business Advisory, Mailchimp RSS and tagged 2019, c, congress, cost segregation, legislation, property, qip, qualified improvement property, tax, Tax Cuts and Jobs Act, TCJA, u.s.. Bookmark the permalink. Follow any comments here with the RSS feed for this post. Comments are closed, but you can leave a trackback: Trackback URL.